Philomena knows what she wants for breakfast! I came into the kitchen to find her getting all the ingredients out. 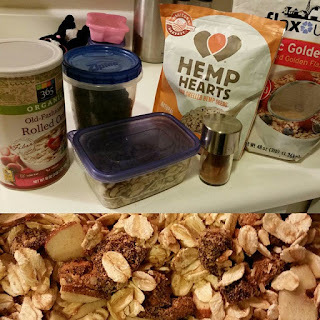 When she doesn't want eggs, I'll make her a protein and fiber rich homemade hot cereal with oats, hemp seed, flax seed, almonds, cinnamon and raisins which amounts to 18.5 grams of protein if you use the recipe below. Needless to say, it's filling and gives her plenty of energy for the school day.